Spread a little oil on a griddle and bring it hot. 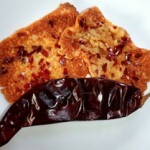 Before it starts smoking, place the slices of cheese on the griddle and sprinkle the crushed chile on top. When the cheese turns brown turn off the heat and wait until the griddle cools off. Carefully scrape off the crusts, keeping them complete. Serve by themselves or with guacamole, pico de gallo or your favorite salsa.